I recently returned from a trip to Novosibirsk, Siberia. I had been invited by Svetlana Komolikova, Director of the School of Rhetoric in Novosibirsk to fly out and give a three-day workshop on public speaking and presentation skills. It was a fascinating experience. 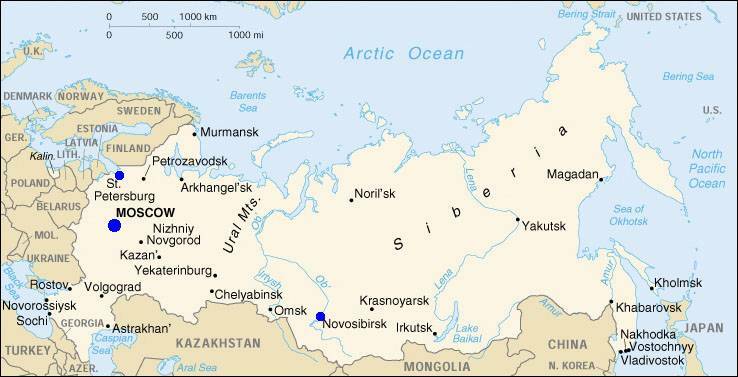 Sitting on the banks of the Ob River, one of the longest in the world, Novosibirsk (“New Siberia” in Russian) is the third most populous city in Russia and a major centre for industry, technology and learning. The city has at least 14 universities and other higher education academies. And it was a real Siberian winter! Stepping off the plane at 6:00 a.m. and walking out into the -25° Celsius early morning darkness was invigorating to say the least! As the snow squeaked under my feet, memories of growing up in Northern Ontario, where winters were often just as cold, flooded back. But if the weather was cold, the reception that I received could not have been warmer. Svetlana, her husband Anton and the participants were terrific. They were engaged; they were curious; and they were willing to push themselves. The photos in the slideshow below give a little flavour of my experience. Many of the participants did not speak English. Although my Russian made tremendous progress during the trip, 40-50 words is not much of a basis for a three-day seminar. So I had to work with both simultaneous and consecutive interpretation. My interpreters, Lika and Lena, were terrific but I still had to be mindful of the basics when working in such circumstances. Should you have to work with interpreters, this post that I wrote a couple of years ago might come in handy. It made a great impact and the participants appreciated the extra effort. I also had some of my slides translated into Russian and also sent detailed notes well in advance of the event so that they could be translated for the participants. If you have to travel to and present to an audience that speaks another language, some extra work on your part beforehand will go a long way during the event. Finally, on the penultimate day of my trip, I had the unique experience of being a guest on a Russian TV Morning Talk Show called “раньше всех”. Pronounced “Ranshye Vsyekh”, it basically means “Earlier Than Anyone”, but I just thought of it as “Good Morning Siberia”. They found out that I was in town and so invited me to come on the show. It was a great experience but also a challenge. As you will see in the video below, I had to focus on the hosts, Anna and Alexander, who were speaking to me in Russian. Meanwhile, Lika, the interpreter, was half whispering the words in English behind me. With my head angled slightly, I was hearing Russian in my right ear and English in my left. It really forced me to focus but was a lot of fun to do! All in all, a fantastic experience with some wonderful people. Special thanks to Svetlana for being a wonderful host and a true professional. She found the School of Rhetoric in Novosibirsk seven years ago and is held in the highest esteem by her clients. It was a pleasure working with her. большое спасибо, Светлана и Сибирь! This entry was posted in Uncategorized and tagged Interpreters, Novosibirsk, раньше всех, Siberia, speaking. Bookmark the permalink. Wow, that sounds like a great adventure. I can’t imagine doing a 3 day workshop through translators. That’s a subject I haven’t heard come up with speakers before. Normally I travel to English-speaking countries, but wouldn’t want to limit it to those. Good advice on translation. Thanks, Julie. It was an adventure, that’s for sure. And I strongly recommend working with interpreters. Yes, it is an added challenge, but it can be very rewarding. My advice is to start small if you can; say, a 30-minute speech or a 90-minute workshop, just to get the feel of it. Thanks for sharing the pictures. Siberia feels much closer to my home in Argentina now. And thanks for being mindful of interpreters’ work. In my experience as an interpreter, live TV shows are some of the most challenging settings for interpretation. In the interview of your video, consecutive interpretation back into Russian would have been less confusing, but there was probably not enough time to accommodate the extra time required by the consecutive mode. Thank you, Laura. Glad you enjoyed the post. You are correct about the TV show. There was just not enough time to organize ear pieces, etc. so we went with what we had. What an experience. Travelling, tourism and professionally prepared work. 5*. Thank you, Nuno. It was indeed a terrific experience. This is a wonderful summary of your trip 😉 I feel like I know Siberia a little better! John, what a brilliant adventure! And how brilliantly complicated trying to give a 3 day workshop through a translator. To this day, not a single workshop that I’ve put on could measure up to that level of complexity. My hat’s off to both you and your spirit of adventure. Thanks very much, Ian. It was definitely an adventure, but one that I would do again in a heartbeat. And working with interpreters is like anything else – the more you do it, the more comfortable you become. A fantastic experience! I’ll join you on your next trip to Siberia.